SANTA CRUZ :The average American uses 555 single-use plastic bags over the course of a single year, according to Dan Jacobson, legislative director for Environment California. To illustrate the enormity of this waste and garner support for Prop. 67, the state’s plastic bag ban, Jacobson asked an aide to don 555 bags and stand with him on the steps of Santa Cruz County Superior Court Monday in 92-degree heat. They were joined by Prop. 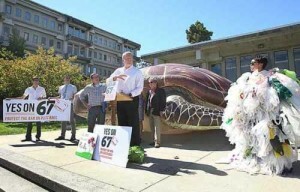 67 supporters Assemblyman Mark Stone, D-Scotts Valley, Santa Cruz County Supervisor John Leopold, local environmental leaders and a 25-foot inflatable sea turtle. Although legislation to create a statewide ban passed during the 2014 legislative session, the plastic bag manufacturing industry gathered enough valid voter signatures to qualify a November referendum on the measure. The American Progressive Bag Alliance, which represents the plastic bag manufacturing industry, is also promoting Prop. 65, a separate measure, which would redirect money collected from the sale of carry-out bags by grocery or other retail stores to a special fund administered by the Wildlife Conservation Board. Jon Berrier, a spokesman for the American Progressive Bag Alliance, said Prop. 65 was designed to ensure that money generated by the sale of carry-out bags did not go to large corporations. Stone called Prop. 65 a “very confusing” measure designed to undermine the statewide ban on plastic bags. Berrier said that there is no scientific evidence supporting the fact that a ban on single-use plastic bags reduce waste or litter and that the ban negatively affects the economy, costing tens of thousands of jobs. The ban is already in place in 151 communities in the state. It has resulted in an 80 percent reduction in bag litter on Santa Cruz County beaches since 2011, according to Katherine O’Dea, executive director of Save Our Shores. A statewide ban, Jacobson said, will protect marine wildlife, reduce litter, promote the use of reusable bags and save taxpayers hundreds of thousands of dollars. In addition, the 2014 bill includes $2 million in loans for plastic bag manufacturers to shift their operations to make reusable bags. “A statewide ban will create the consistency we need across the state rather than the hopscotch of regulation we currently have in place,” Jacobson said. Ryan Kallabis, communications manager for Save Our Shores, which partnered with Assemblyman Stone and Supervisor Leopold to enact the first local bag bans in Santa Cruz County, said the statewide ban is vital to stemming the tide of plastic and Styrofoam brought to Monterey Bay beaches by tourists. Assemblyman Stone decried the plastic bag industry’s “cynical” attempts to undermine the will of the people of California. He also said the statewide ban would not weaken Santa Cruz County’s legislation, which is significantly stronger than the 2014 statewide band signed by Gov. Jerry Brown. As for the 25-foot inflatable seat turtle, Jacobson said its material would eventually be donated to a company that makes recyclable bags.